This morning I saw a picture on the internet of Grove Park Library. 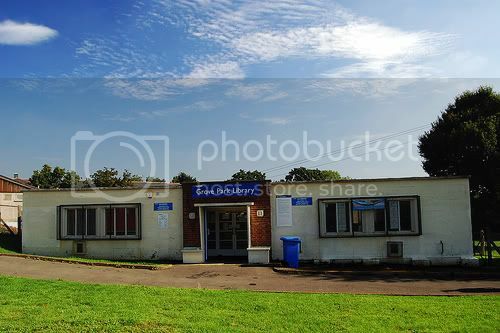 I’m sure you wouldn’t know it; it’s a little local library in the London Borough of Lewisham where I grew up. I’d not seen it for years until this morning – we moved away from Grove Park when I was fifteen – but when I looked at it earlier on this day of campaigns to save Britain’s libraries I realised what an ugly building it is. A one-story box of a prefab thrown up as a temporary measure on a street corner forty years or more ago with metal cages over its windows and mildew seeping through the whitewash. It’s only now that its ugliness has struck me because as a child the library’s appearance made no impression on me whatsoever. I knew every crack in the plasterwork, every sliver of flaking paint on every windowsill, but none of it registered. It didn’t matter what Grove Park Library looked like because its only function for me was as a gateway to magical places. On most Saturday mornings of childhood my sister and I would be walked round to the library by our parents to return the three books we’d withdrawn the previous Saturday and, the highlight of my week, choose three more. I remember the librarian but I can’t remember his name. Was it John? A hangdog-faced but kindly man with thick-lensed glasses and a tweed jacket. I can still hear the thump-click of his date stamp before the hardback cover snapped shut on each book and he handed my choices down to me, my eye-level at the same latitude as the top of the counter. A hint of a smile would pull at the corners of his mouth and he’d nod slightly. Good choices. I learned to think thanks to Grove Park Library. My imagination was unshackled there in that charmless building full of wonderful things. Asterix, Tintin, Just William, Jennings, the boys in Michael Hardcastle’s football novels: they all lived in that little building, probably giggling and whispering to each other across the shelves at night. Centuries of history, untold miles of travel, magical stories about magical places, they were all there, a short walk from my house and a thump-click-snap away from sharing their tales with me as they had with so many other local kids. It’s unlikely I’d ever have read any of those books without Grove Park Library. We’d never have afforded them. It opened up whole worlds to me, worlds of fiction, of poetry, of brilliant storytelling, of characters who became my friends and some who became my enemies. Today I’m a writer. Maybe that’s thanks to Grove Park Library. Maybe some of my books are on the same shelves that I used to browse as a child. Maybe the people I’ve written about are now whispering to each other in the night as the moonlight casts latticework shadows on the floor through the cages on the windows. They might not be whispering for much longer though, for Grove Park Library is just one of those earmarked for closure in the UK following savagely philistine funding cuts. There’s a campaign to save it. I hope it survives but I fear the prospects aren’t good. It may be ugly to look at but Grove Park Library, like all other local libraries, is not just another resource that has a bottom line; it’s a cabinet of dreams, a training ground for the imagination, a vital cog in the machinery of personal development. These libraries are a right, not a privilege. They’ve quietly got on with things for decades – now we need to shout about them. I live a long way away these days but am always aware of how much I owe that little building on the corner; a debt that can never be fully repaid. If Grove Park Library closes then may whoever is responsible be forever woken at the dead of night by the faint sibilance of whispering and haunted by the persistent heartbeat of thump-click-snap.